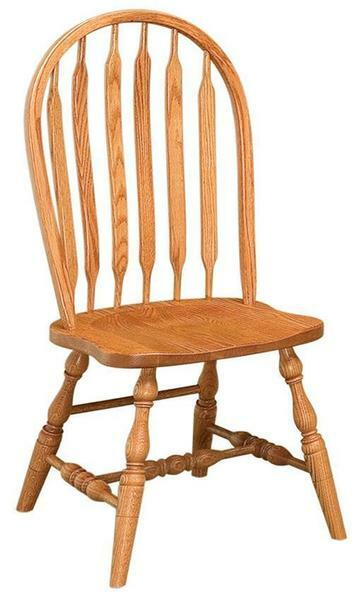 Beautiful spindle work contributes to the gorgeous shape of the Amish Bent Paddle Windsor Kitchen Chair. With a scooped seat and classic Windsor style, the Bent Paddle Windsor Kitchen Chair is a best seller for your eat in kitchen. Surround your table with the refined colonial style that these Windsor chairs offer. These Windsor style chairs are seen here in oak wood with medium stain. Oak wood offers a heavily defined grain pattern that lends itself to a country furniture collection easily. Oak furniture creates a warmth in any room, making it a great choice for your kitchen table.